When asked what they love most about their corner terrace houses, most of these homeowners would say that it’s the strip of land between their houses and the neighbours. This is where air flows around the house, and light illuminates the inside of the house without any air well. But it is also precisely this strip of land that leaves homeowners stumped as to how to landscape it. 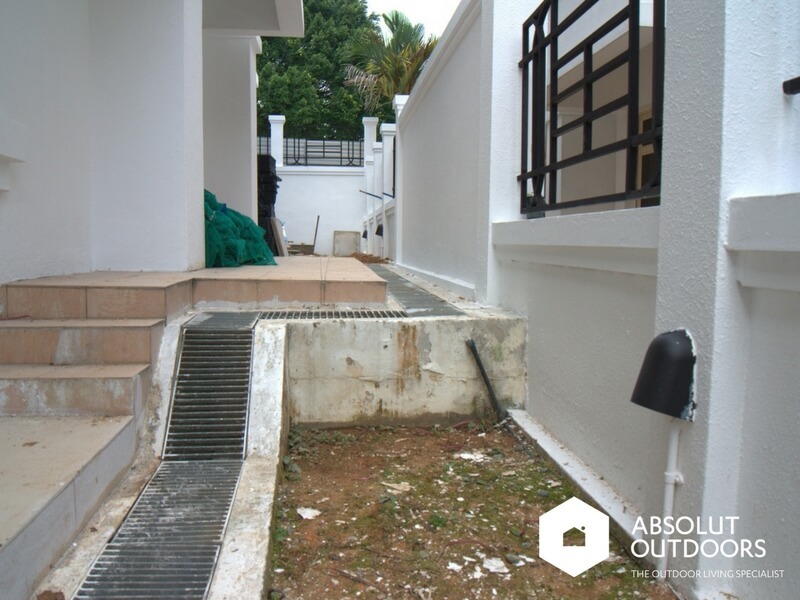 Leave it bare – with exposed drains, ceramic tiles and dry grass patches and you may not even want to step into that part of your house. But renovate it tastefully and you’ll find yourself wanting to spend more time outdoors, right at home. You’ll be surprised at how little effort it takes for a corner terrace home to shed its 80’s yester-year look and take on a timeless lush sanctuary vibe. Here are 5 ideas that can quickly and easily transform your corner terrace outdoors. Bonus point? They hardly need any maintenance, saving you time, money and effort. If you’ve got open drains and uneven levels featuring tiles, grass and other flooring, why not consider levelling up the ground? This makes the place look much neater, and removes a tripping hazard for young children and old folks. Levelling soil-based ground while ensuring that water drainage is smooth is one of our core strengths. 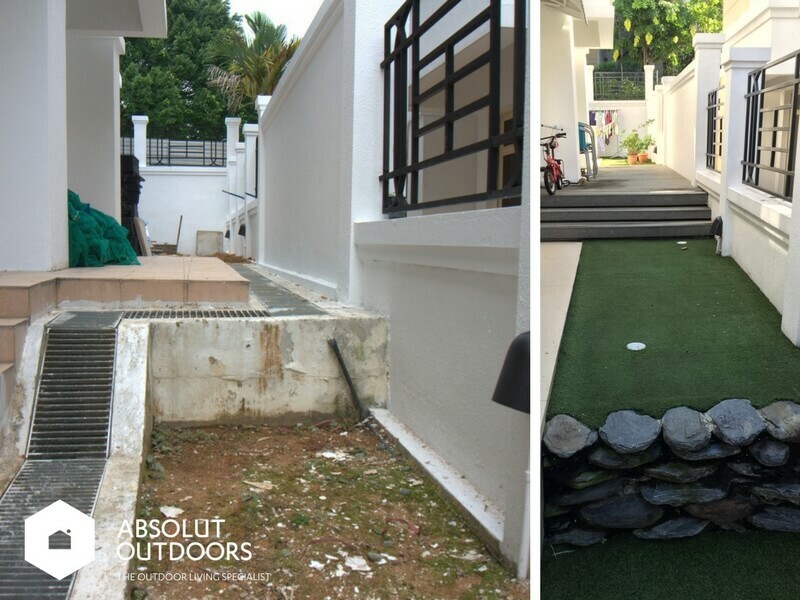 Once the ground is level, you can lay it over with artificial grass or decking, or both. Up your game by practising at home. 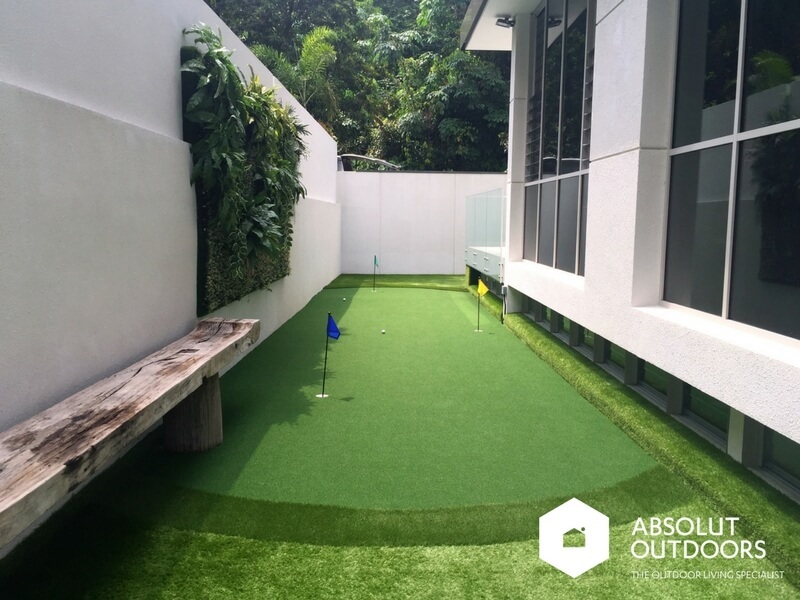 We install putting greens that plays like the real putting greens so that you can have a realistic practice area. From the placement of the hole(s) to the roll of the ball and apron placement, we take extra care to craft your putting experience. Now your friends will start wondering how you managed to improve your short game so quickly. Introducing a gorgeous green backdrop by way of an artificial vertical garden is the way to go. Place it strategically where you’ll be able to enjoy the view from your dining area and you’ll have yourself a themed dining area as well. 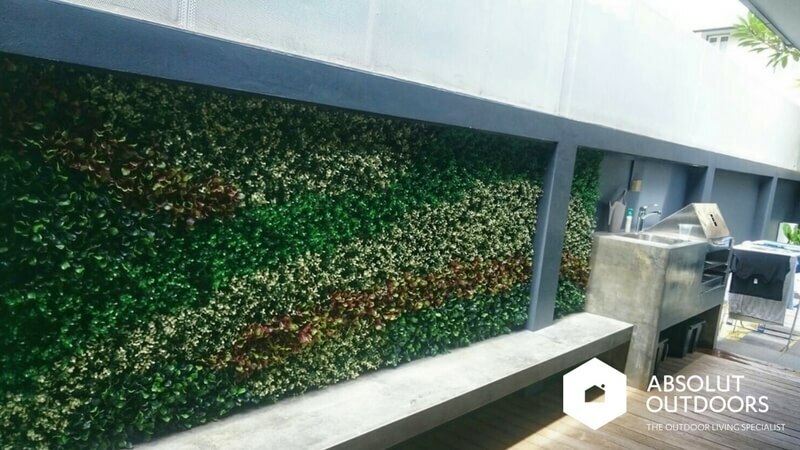 These artificial vertical gardens use realistic-looking foliage and don’t need any maintenance. 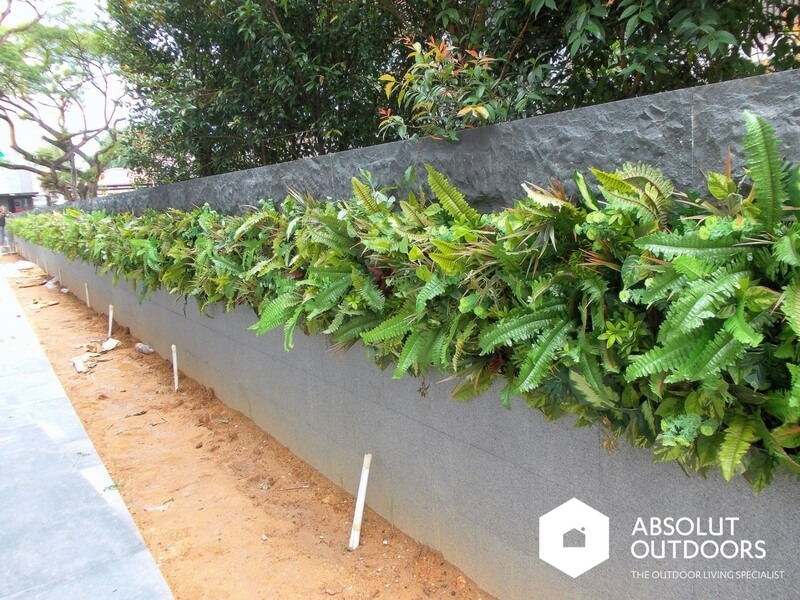 If you like the soothing trickle of water (or maybe that’s what the fengshui master prescribed), why not place a wall water feature right along the side of your corner terrace house? And frame it with an artificial green feature for good measure? I can assure you that the combination of lush green foliage and soothing water will have you feeling like Tarzan – ready to conquer the jungle. 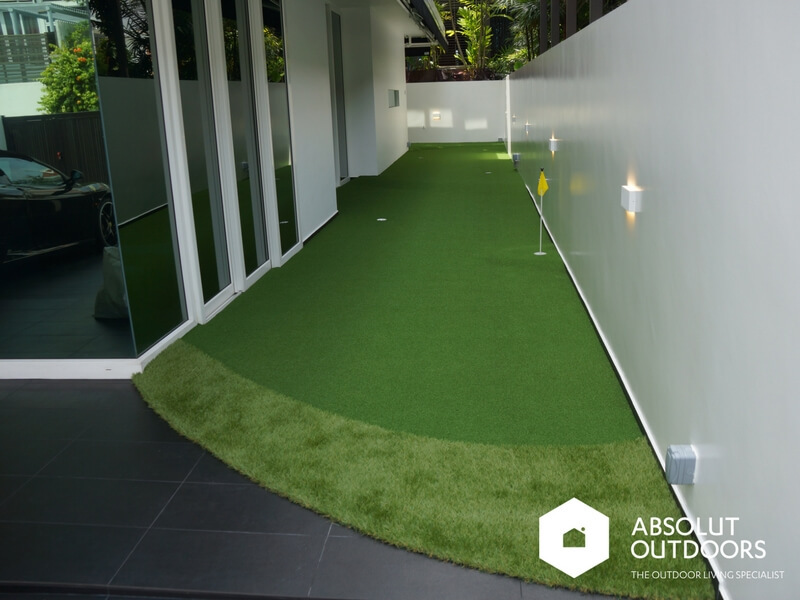 Did you know that our artificial grass also comes in many other colours? Here’s a fun hopscotch area that we did. The colour turf is made to withstand the hot sun and rain and will last for years. 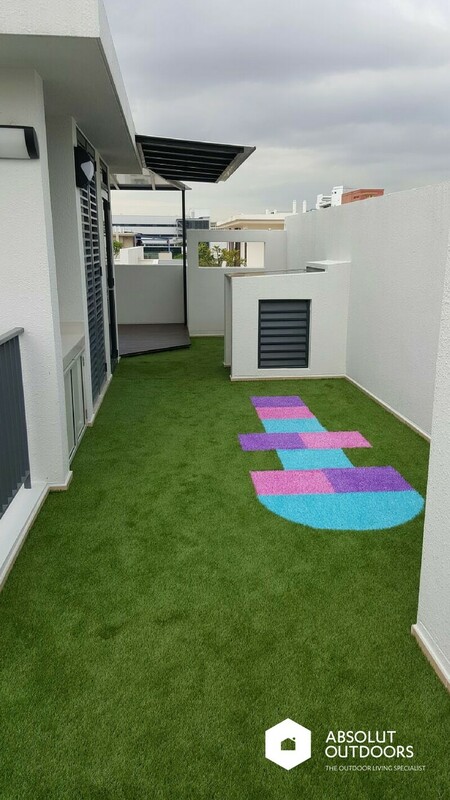 We can cut out the coloured turf into any shape or size. Alphabets, the sun, moon, ship, tree… If you have young kids at home, why not let them imagine what they’d like and let us bring their imagination to life? I hope these 5 ideas help you with your corner terrace outdoor renovation. Whether it’s for renovating your new landed home or you’re simply thinking of refreshing your garden, we’d love to help! 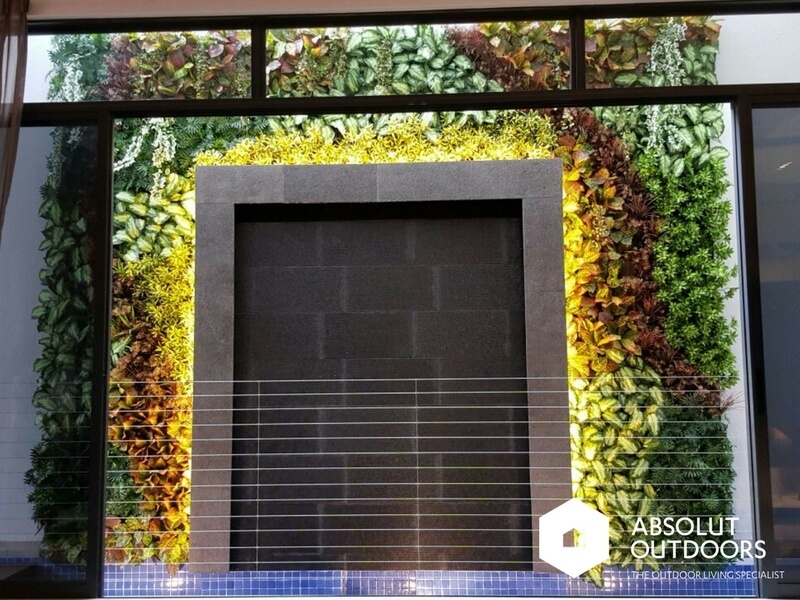 Please contact us at enquiry@absolutoutdoors.com or call us at 67498087 today.